The games you already know & love - just better. of locations near you from restaurants to retail stores and everything in between. know & love - just better. DID YOU FIND A CODE? Great, now save it for some awesome prizes! Simply download the app, create your profile, then enter in your codes. Boom - It’s that easy! 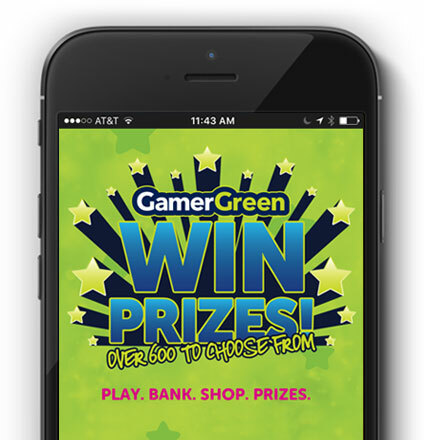 Get our GamerGreen App, which is available on apple or android devices. Locate hundreds of locations near you and well ... just play games! When you win you earn virtual tickets that you can store right in your profile. Shop hundreds of cool prizes. Shipped fast and free, right to your door. Instant gratification - right at your fingertips. Join GamerGreen today and start earning your way to some amazing prizes. It’s that easy! Thank you so much for the continued support – we owe each of you a hug! Find Us Almost Anywhere and Everywhere. Seriously - we’re taking over the world muah ha ha ha. What are you waiting for? Join GamerGreen today and start earning your way to some amazing prizes. It’s easy!